The bronze doors of the Senate wing are comparable to those in the House. Each valve consists of three panels, depicting events in the life of George Washington and Revolutionary War scenes, and an allegorical medallion. 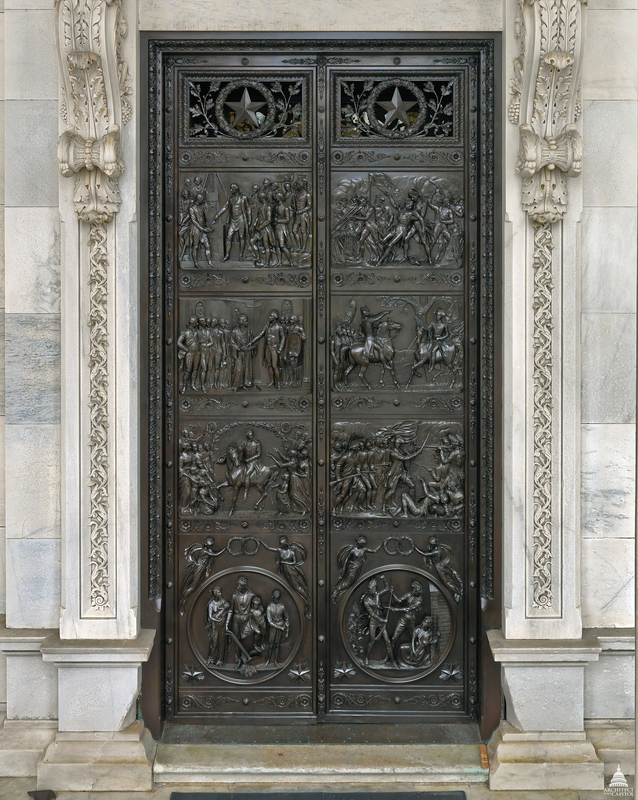 The Senate Bronze Doors were created for the east portico of the new Senate wing during the mid-19th-century expansion of the U.S. Capitol. They were designed and modeled by the American sculptor Thomas Crawford in Rome in 1855–1857. After Crawford's death in 1857, William H. Rinehart was commissioned to complete the work and the models were shipped to America in 1864. They were cast by James T. Ames at his foundry in Chicopee, Massachusetts, in 1864–1868, and placed late in 1868. The descriptions below start at the top of each valve and proceed downward. On September 18, 1793, the cornerstone of the Capitol was laid in the southeast corner of the foundation with Masonic rites. President George Washington is shown with the trowel in his right hand. The inauguration took place on April 30, 1789, on the balcony of Federal Hall in New York City. Chancellor Robert Livingston is depicted administering the oath of office, and George Washington's right hand is resting upon the open Bible. Vice President John Adams is shown on the right, with other noted guests at the left. The panel depicts George Washington receiving an ovation at Trenton, New Jersey, en route to his 1789 inaugural in New York. A triumphal arch of flowers was built over the bridge at Assumpink Creek, the place where Washington had defeated the British. Small girls strewed flowers before him as he slowly rode across the bridge, accompanied by the singing of the multitudes gathered to honor him. This tranquil scene shows a farmer and his family gathered around a plow and a sheaf of wheat. On June 16, 1775, the British Army intended to seize and fortify Bunker Hill, opposite the city of Boston. Colonel Prescott and a thousand American patriots entrenched themselves on Breed's Hill, which was lower but nearer Boston. American reinforcements led by Generals Putnum and Warren joined in the intense hand-to-hand battle. General Warren was shot; in this panel, Colonel Prescott is shown supporting the dying General. On June 18, 1778, the British Army evacuated Philadelphia and proceeded through New Jersey toward New York. General Charles Lee and General Lafayette were in command of the militia that was to harass the rear of the British Army in order to bring on a general engagement. A successful attack was made, but Lee failed to hold the ground. General Washington met the retreating troops and rallied them. The panel depicts General Washington rebuking General Lee with great severity for his failure to obey his orders. The scene is set at the close of the war when Cornwallis was entrenched at Yorktown, Virginia. The central figure in the panel is Alexander Hamilton, who was granted permission by General Washington to lead the attack on one of the two redoubts that had to be taken. A Hessian soldier is shown in a death struggle with a farmer, who is protecting his wife and child from the soldier's assault.